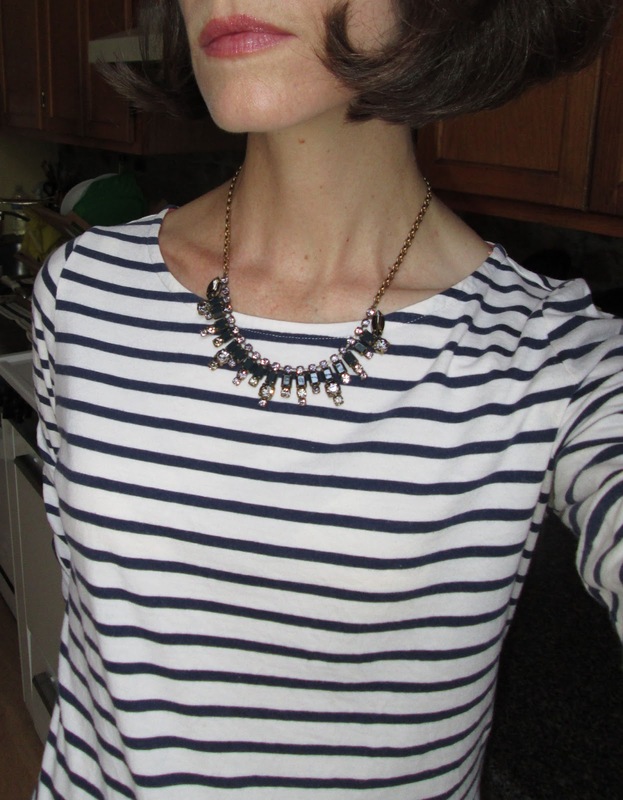 I love this necklace with stripes! I have had costume jewelry on the brain because of the gorgeous exhibit Fashion Jewelry: The Collection of Barbara Berger as well as a post by the lovely Déjà at Une femme d’un certain âge showing a great necklace by J. Crew. So I suppose I was susceptible to a necklace purchase and this one sent me over the edge. I went to J. Crew looking for replacement T-shirts on sale (a Planned Purchase, but they were sold out!) and came away with this instead (and a little summer dress for my daughter). I haven’t bought a J. Crew necklace in a couple of years—and yes, this was against my Shopping Ban, I am a little disgusted with myself!—but this one is totally me, not offered on the website, and I couldn’t walk away from it. I kept hearing Barbara Berger’s words in my head when she spoke of a jewelry purchase as a coup de coeur. Sometimes you just know. I plan on wearing it as part of my Casual Party Outfit for the next “How I Wear My” post in August—and I do hope you will join Adrienne of The Rich Life (on a budget) and me! Without flash. I love that shade of blue in the rectangular stones. 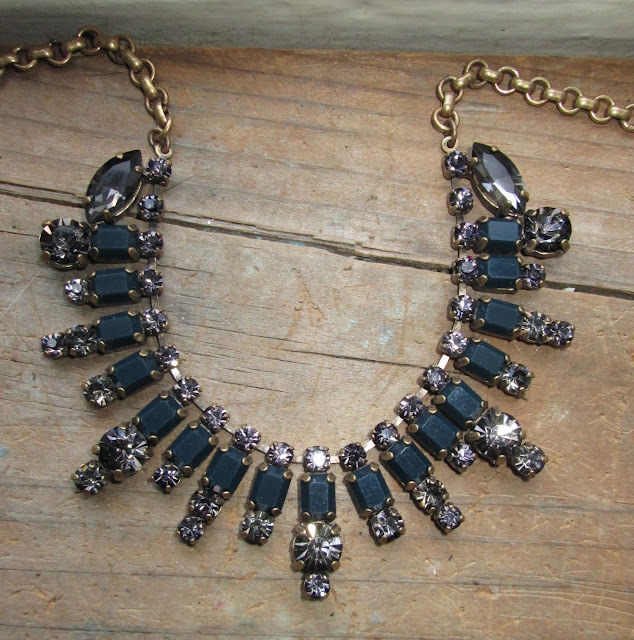 Have you bought a glittery necklace lately? Tell me all about it! And send a picture to Adrienne or me showing your Casual Party Outfit by July 31! I LOVE this necklace and I agree it looks amazing with the stripes..love! will send a pic soon! Oh Jill, it's gorgeous! And looks fantastic with your stripes. A lot of the J.Crew pieces have been tempting me lately. They seem to hit a place I'm calling "whimsical glamour" that really appeals to me. Thanks for the mention! I LOVE that necklace! I can see why you broke your shopping ban. 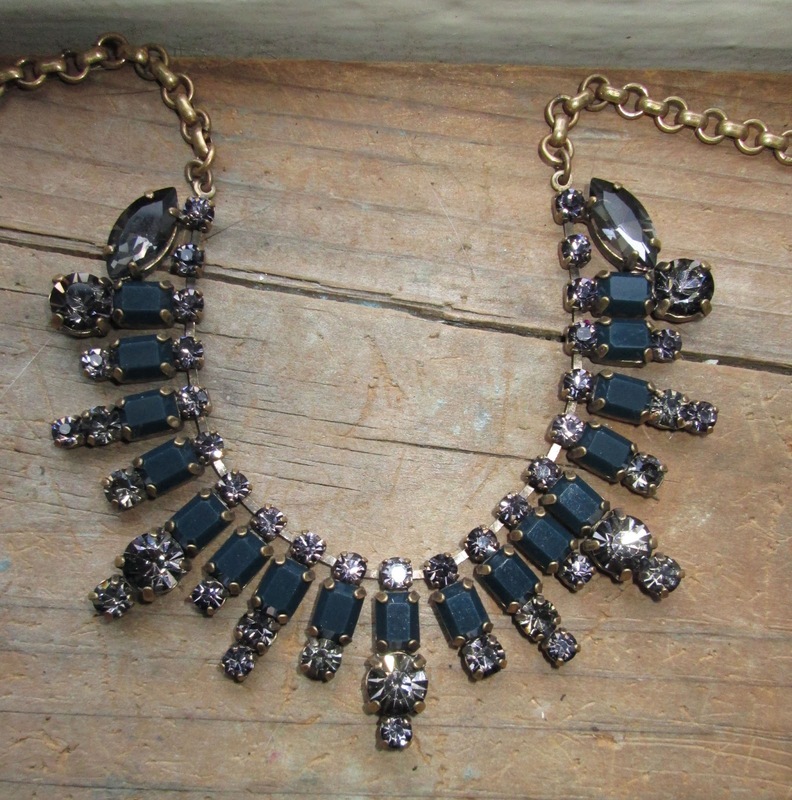 I think you were wise to snap this gorgeous necklace up! It works really well with your stripes. It reminds me of a vintage Sherman necklace that Mother owns. I can see this peeking out from under a cashmere sweater in the fall too. It is beautiful, Jill, and it will go with all sorts of outfits and situations, so enjoy the heck out of it. I'm on a spending diet the past few months, too...I can't even let myself *plan* any wardrobe purchases, and I'm making my basics last longer than I usually might. Trips coming up, and doc bills, and sewer work on the street. Anyway, I feel your pain! This necklace looks so chic with your stripes. Some rules are meant to be broken and somethings are just meant to be. I think you scored! I adore this necklace and it looks just wonderful on you! It totally suits you. Bravo! Nice collection. If you want to purchase Jewellery Gemstones that will not only make you gorgeous looking but also bright your destiny, visit GemsVidhi You can also consult to our Jyotish experts for which gemstone will suit you.